First Step. After signing consent forms – awaiting Gamma to start – get this tumor gone! Krysti and the Halo. The first thing the doc does is inject your head/scalp with lidocaine to numb it. It pinches a bit, but this about the most I felt. 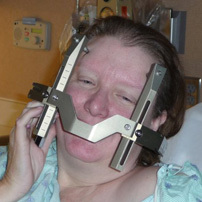 Then they screw in the halo frame with 4 screws – two in the front on your forehead and two in the back (no shaving of hair even). The frame feels heavy. You are then taken to MRI with the frame on to get exact tumor photos for precision stereotactic placement of the beam. Next it’s a “hurry up and wait” as the doctor and the computer are creating a treatment plan. Krysti and the Space Helmet. The clear helmet gives you a space explorer look! It attaches to the frame and you wear it into the machine where the huge heavy beam directors (probably not the correct verbiage) are placed over it. As I mentioned, you smell something like burnt crayons while in the machine. 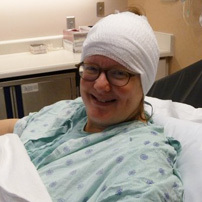 My location (at IU Simon) let me bring my own CD to listen to while in the Gamma Knife machine. 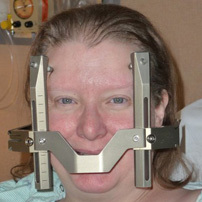 Krysti Immediately Post Treatment. After Gamma they unscrew the frame from your head. There was just a bit of blood, but some pressure from the doc and nurse stopped that. I had to wear the gauze for a few hours and had band-aids on my forehead. I couldn’t wash my hair for a couple days, and healed in about a week or ten days. Krysti Post Treatment. Felt good enough both times to meet a bunch of the family at a Mexican restaurant and have a beer. Although the gauze looks intimidating, I felt fine! 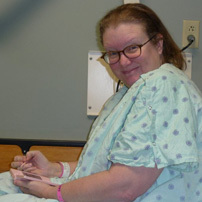 Editor’s note: our favorite photo shows Krysti talking on her cell phone while waiting for treatment. Can you see that smile behind the halo?